MADRID – Sept. 12, 2017 – A combination immunotherapy treatment showed better overall survival in patients with previously untreated advanced or metastatic renal cell carcinoma than current therapy, according to results from a phase 3 clinical trial presented at the Presidential Symposium of the European Society for Medical Oncology 2017 Annual Meeting in Spain. The study, which is sponsored by Bristol-Myers Squibb and co-led by Drs. Hans Hammers, Bernard Escudier, and Robert Motzer, reported that the combination of nivolumab and ipilimumab was superior compared with sunitinib, the current standard of care, with respect to overall survival and response rates in patients with intermediate and highly aggressive kidney cancers. Combination immunotherapy with nivolumab and ipilimumab is already FDA-approved for treatment of melanoma and is being tested for other cancers. Kidney cancer is the sixth most common cancer type affecting both men and women. “This is a very important result for kidney cancer patients. 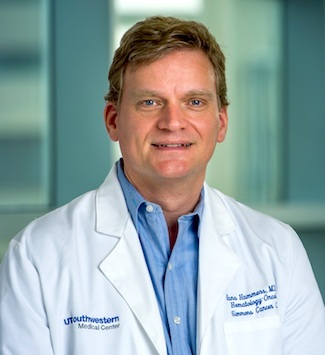 The study was primarily conducted in patients who we know have a poorer prognosis and the data are very clear: Dual immune checkpoint inhibition with nivolumab and ipilimumab is superior to the standard of care drug, sunitinib,” said Dr. Hans Hammers, Associate Professor of Internal Medicine and Co-Leader of the Kidney Cancer Program at UT Southwestern. “I believe this combination immunotherapy will be the new standard of care for previously untreated kidney cancer patients, especially for those with intermediate and poor risk disease. The efficacy data are remarkable and place immunotherapy front and center for treatment of our patients,” said Dr. Hammers, who also leads a phase 2 investigator-initiated study at UT Southwestern evaluating the new combination together with stereotactic radiation to assess whether results can be improved even further. The findings resulted from CheckMate-214, an international, randomized phase 3 trial that evaluated more than 1,000 patients. The combination group received nivolumab 3 mg/kg plus ipilimumab 1 mg/kg every three weeks for four doses followed by nivolumab 3 mg/kg every two weeks. Patients in the comparator group received sunitinib at standard doses. “This is a significant step forward toward the ultimate goal of achieving a cure for our patients,” said Dr. James Brugarolas, Professor of Internal Medicine and Leader of the Kidney Cancer Program. The Kidney Cancer Program, a disease-oriented program of UT Southwestern’s Harold C. Simmons Comprehensive Cancer Center, is one of two kidney cancer programs in the U.S. recognized with a Specialized Program of Research Excellence (SPORE) award by the National Cancer Institute. Discoveries at the Kidney Cancer Program have significantly impacted our understanding of how kidney cancer develops and are paving the way for new treatments. The Simmons Comprehensive Cancer Center, the only National Cancer Institute-designated Comprehensive Cancer Center in North Texas and one of just 49 NCI-designated Comprehensive Cancer Centers in the nation, includes 13 major cancer care programs. In addition, the Center’s education and training programs support and develop the next generation of cancer researchers and clinicians. Simmons Comprehensive Cancer Center is among only 30 U.S. cancer research centers to be designated by the NCI as a National Clinical Trials Network Lead Academic Participating Site. Dr. Hammers is the inaugural Eugene P. Frenkel, M.D. Scholar in Clinical Medicine and a paid consultant for Bristol-Myers Squibb. Dr. Brugarolas is a Virginia Murchison Linthicum Endowed Scholar.